Not a shipwreck! 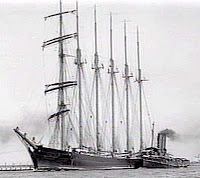 In 1883, the Lord Woleseley (or Wolseley, Wolesley, or Wolsely) was built as a 4-masted 2577-gross ton iron ship. She was launched in Belfast, Northern Ireland on 21st July 1883 . She later became the Columbia, Lord Wolsely* (1904), Everett G. Griggs and E.R. Sterling. * Hence some of the confusion over spellings. In 1927, enroute from Port Adelaide to Britain, she met with a series of accidents. On 4th July 1927, she lost her main and mizzen masts in a gale whilst she was north of the Falkland Islands but she continued her voyage. On 4th September 1927, she was again dismasted, this time during a hurricane. She lost her foremast and the chief officer (First Mate?) was killed. On 15th October 1927, she managed to reach the port of St. Thomas in the West Indies. There were no repair facilities available there so she was towed from the West Indies to London, England by tug. After 286 days at sea, she reached the River Thames, England as a floating shambles. She was so badly damaged that she was not repaired but sold to shipbreakers for £4,000. She had been broken up by 1928.